The volume of fresh and frozen pork sold at retail level continues to decline year-on-year but total spend is up, driven by higher consumer prices. 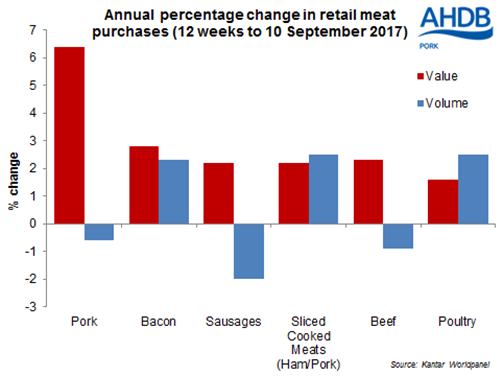 In the 12 weeks to September 10, retail volumes of fresh/frozen pork sold decreased by 0.6% on the year, continuing the recent trend, according to latest data from Kantar Worldpanel. However, average retail prices increased by 7% over the same period, leading to a welcome 6% year on year increase in total spend. Volume sales of roasting joints declined year-on-year by nearly 2% during the period, while volumes of loin and shoulder roasting joints fell by 11% and 8% respectively. But the amount of leg roasting joints sold increased by 15%. There was a big fall in the volume of mince sold, down 28% on the same period in 2016, which may be attributed to customers switching from higher priced beef mince, according to AHDB Pork. Sliced cooked meat remained one of few pork products to decrease in price year on year, albeit marginally (-0.4%). However, a rise in volumes sold (3%) led to total spend increasing by 2% on the year during the period. The picture for other meats in the 12 weeks ending 10 September was more mixed. Volume sales of fresh/frozen beef fell by 1% on the year, although as the average unit price increased, total spend rose by 2% on year earlier levels. For fresh/frozen lamb, the volume sold decreased by 9%, while the average unit price increased by 3%, resulting in total spend falling by 7%. Fresh/frozen poultry prices fell by 1% in the 12 week period, but a 3% rise in volume sold led to total spend rising by nearly 2%.